Hakim is a ground-breaking Egyptian pop artist whose music has revolutionized the genre of sha'bi, the music indigenous to Egypt. Hakim's infectious and captivating melodies, along with his lyrics of the street, make his music popular to mass audiences. His rhythmic and audience-friendly music are the trademarks to his success. 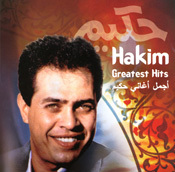 Hakim is a ground-breaking Egyptian pop artist whose music has revolutionized the genre of sha'bi.